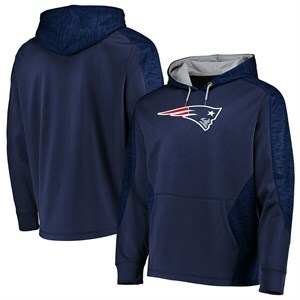 For a lighter hoody sweatshirt that still keeps you nice and warm try the New England Patriots Blue Shield Synthetic Hoodie Sweatshirt which is made with a loose-fit body made from 7.7 oz. 100% Polyester Fleece that; even though it is not as heavy or bulky as a cotton sweatshirt locks in your body heat to keep you nice a warm when used as an outer layer. To show your team pride this synthetic hoodie comes with front screen printed team graphic, a sublimated tonal print on the shoulder, sleeves, and hood, a color contrasting hood inner lining, and also features a front pouch pocket, a draw-cord hood, and ribbing on the cuffs and bottom band. NFL OFFICIALLY LICENSED: Team Graphics and colors are licensed by the respective team and league and are printed high quality logos. Every Hoody comes with a licensed tag to ensure that this is Authentic Majestic and NFL Clothing. MACHINE WASHABLE MATERIAL: This Pullover Hood is constructed from 100% Polyester material that comes with an Athletic fit body that works great as an outerlayer to keep you nice and warm. SCREENED TEAM GRAPHICS: Since this Hoody is made by Majestic it follows stringent quality guidelines so the team logos should give your season after season of wear so you can stand out at Patriots games all season long. SHOW OFF YOUR TEAM SPIRIT: This Pullover Patriots Hooded Fleece Sweatshirt makes a great gift for any New England fan you may know so they can show up at the game and there will be no mistake which team is their favorite. FREE GROUND SHIPPING: Save yourself some money when you order from us with our Free Ground Shipping to any location in the Lower US48 without coupons or codes you have to enter, our system automatically gives you the Free Shipping.